You are here: Home / Street dogs…..
Street Dogs …. it is not a new music album, it is about the menace of street dogs in Bangalore. 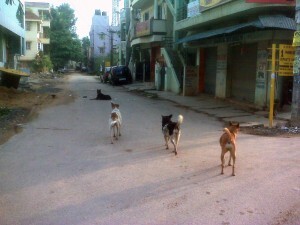 Bangalore streets are with stray dogs and threat to human life. I am presenting here some of the pictures shot with my Blackberry on the stray dogs while on my morning walking.. Some dogs are soft,some are calm and some are ferocious and whatever, who dares to go nearby. 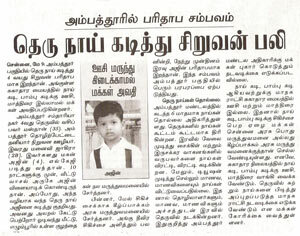 I am also a “dog lover” and this story is about the street dogs menace recently faced in Bangalore. When we are talking about the stray dogs on the street, we can also see some dogs are trained and “domestic”. In this picture, the dog is sitting on the railway gatemen platform as if it is “manning” the level crossing. If you see the a small blue board on the back ground, it reads “gate man on Duty”. It is very nice to watch this sight. Some of the “owners” never let their dog freely on the road. They keep them in front of their home tied to a chain. Here, a domesticated dog is tied in front of the closed shop to keep vigil. Is your city is free of stray dogs??? be sure and be safe. It’s a sarcastic note, how dogs also vanish when somebody comes to hunt for them, maybe they are in politics too ! You should take it up with local authorities, thro’ press , captivating the photos on camera which could display time & date & send it to them. anyway pl ensure you have safe & enjoyable walking. We look for separate edition on your pets, & an album exclusively for ” buchu ” !